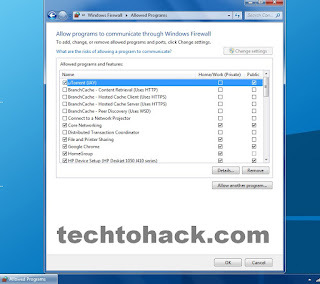 How To Block Program in Firewall in Windows 7 | easily - Tech To Hack — HowTo Tutorials, Tech hacks & YTvideos. Go to Start Menu and Search "firewall" and Click on windows firewall with advanced Security. Click "Inbound Rules" and then click "New Rule" to open the New Inbound Rule wizard. Click "Port" and then "Next." Select "TCP," enter "1934" (without the quotations) into the "Specific Local Ports" field and then click "Next." Select "Block the Connection" and then click "Next." Choose whether to disable the port on the corporate domain, a private network or a public network. Click "Next." Enter a name, such as "Adobe Media Server," into the "Name" field and then click "Finish." Create another rule following the same process, except this time select "UDP" when prompted. Select "Outbound Rules" from the left pane, click "New Rule" and follow the on-screen instructions once again to block TCP 1934 and UDP 1934. Copyright © Tech To Hack — HowTo Tutorials, Tech hacks & YTvideos.